EV industry leaders say the new proposal changes little from the original, which regulators rejected. In early September, the California Public Utilities Commission rejected Pacific Gas & Electric’s $654 million application to build 25,000 electric-vehicle charging stations. Regulators cited concerns over the size of the program and protecting against unfair competition. In its ruling the CPUC mandated “a more phased deployment approach,” and limited PG&E’s program to 2,500 EV chargers deployed over two years. On October 12, PG&E filed a revised proposal as directed by the CPUC. The new application lays out two options: a compliance proposal and a preferred “enhanced” proposal. Under the compliance option, PG&E would install 2,510 EV chargers at a total cost of $87 million. Under the enhanced option, PG&E would install 2,510 charging stations over two years, and about 7,500 over three years at a total cost of $222 million. These expenses would be recovered through the rate base. The utility argued in its filing that the two-year program was unlikely to generate enough data to properly evaluate the benefits of rolling out a larger-scale EV program, which PG&E said is essential to meeting California’s ambitious climate goals. Conversely, the three-year phased-in approach “will generate a sufficient amount of data to inform the next phase of deployment,” according to the filing. “PG&E has a long track record of supporting EVs and we look forward to working with the Commission to make this happen,” PG&E said in an emailed statement. However, several stakeholders in California do not want to see the proposal realized, at least not in its current form. According to Andrea Deveau, executive director of the Silicon Valley advocacy group TechNet, the revised proposal includes some new wording but remains fundamentally flawed. On a station-by-station basis, PG&E’s new proposal is even more expensive than the original, she said. The 25,000 EV charger option would cost customers about $26,000 per station, the 2,500 compliance option would cost customers about $35,000 per station and the 7,500 enhanced option would cost customers more than $29,000 per station. According to Pasquale Romano, CEO of ChargePoint, privately funded stations typically cost $7,000, which puts PG&E’s proposal well above market price. Romano added that the proposal does nothing to address concerns regarding unfair competition. Under the new filing, as with the original filing, PG&E would control the selection hardware vendors and network services providers. PG&E writes that it will ensure EV-charging equipment is procured in an open and competitive manner. But Romano says utility control of procurement, even though the utility is paying for the program, would reduce flexibility for the site owner and stifle competition among suppliers. Another issue with PG&E’s proposal, according to ChargePoint, is that it gives PG&E the authority to set charging rates for its customers. Because PG&E is a regulated entity, this approach will create roadblocks and prevent site owners from offering flexible pricing. Some site owners may even choose to let drivers use their chargers for free. About 60 percent of ChargePoint’s customers make their stations free for at least part of the time. 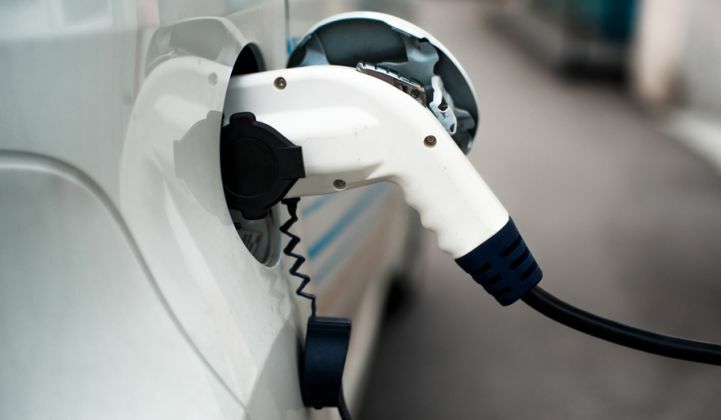 As PG&E’s program receives scrutiny, Southern California Edison and San Diego Gas & Electric’s proposed EV infrastructure programs are moving forward under settlement agreements with broad stakeholder support. SCE has put forward a $355 million plan for up to 30,000 chargers, and SDG&E has put forward a $103 million plan for a vehicle-to-grid integration program. Both programs phase in over time and allow customers to choose and operate the charging equipment. Regulators instructed PG&E to take a closer look at these filings before resubmitting its plan last week. For ChargePoint, PG&E’s revised proposal is “mindboggling,” Romano said. The charging industry is an ally of utilities. The utility has a slew of companies competing to deploy their dollars effectively, and the utility gets to rate-base the costs. And there are examples from SCE and SDG&E of how this can be done in a collaborative way. Debate over PG&E’s EV-charging program comes as the utility has pledged to invest one-third of its annual fleet purchases in EVs over the next five years, totaling more than $100 million. PG&E Chairman and CEO Tony Earley has been a champion for EV adoption in the utility industry, underscoring the need for continued efforts while signing on to a White House climate initiative this week. The CPUC will accept testimony from intervenors in the PG&E EV infrastructure filing through November 16. Evidentiary hearings are scheduled for early February 2016, and a decision is expected in June.